A family cultivates a soaring dream on the southeast corner of Grand Avenue at Syndicate Street, supporting three generations with a business that builds bridges between Saint Paul and the traditional tastes of Nepal. That’s where the Sharmas, who initially came to Minnesota in 1977, run Everest on Grand, the first Nepali restaurant in the state. Featuring a maroon awning with a white outline of Everest’s mountain peaks, a pair of eyes looking out onto the avenue, and the motto “The Tallest Taste,” the restaurant has become a familiar landmark on Grand Avenue since 2000. It was not, however, something the family originally thought they would do. Padam Sharma came to Minnesota in 1977 with his wife, Kamala, and their two children—son, Sam, and daughter, Pankaj—to pursue a master’s degree in Soil Science. The family lived on the Saint Paul campus until Padam earned his degree in 1981; then they moved back to Nepal, where he taught university classes until 1985. The family returned to Minnesota so that Padam could earn his Ph.D., after which he took a research position at North Dakota State University. They eventually returned to Minnesota, where Padam worked first as a researcher at the university, then as a consultant in a computer business. Life was good, and Saint Paul was a great place to live. As their children became adults and began attending the University of Minnesota, the family began to think about creating a place where a growing community of people with an interest in the culture of Nepal could gather. After years of life as a professional soil scientist, Padam decided to plant a new seed, cultivate a strong crop of cultural experience, and bridge the gap between Americans and Nepalese through food. The family nature of the business has been its greatest strength, especially because Kamala, Pankaj, and Pankaj’s husband, Ujjwal, are all peak-level cooks of Nepalese cuisine. “It’s important to know your chefs and their prior experience,” Padam explains, adding that such skills within the family proved to be the essential requisite for success. “Grand Avenue is very special in terms of the unique nature of businesses here,” Padam explains. “You have a house, and you can put in a business, and you can live there, you know? It has its own charm.” A type of charm, he believes, that makes it the first choice for a business location. While he and Kamala still live in the family house elsewhere in Saint Paul, the restaurant’s proximity to other important city landmarks—it is across the street from Kowalski’s Market—makes for high visibility and a steady stream of traffic. Everest on Grand is a perfect place to share Nepali food and culture, strengthen ties to the old country, and cultivate a growing garden of support for the family’s children and grandchildren. While there is plenty of stress involved with running his own business, Padam finds the rewards tremendous. “If I were still doing my research work,” he explains, “I would be meeting a couple of [scientific] professionals year in and year out, but here you meet people coming all across the experience of life. 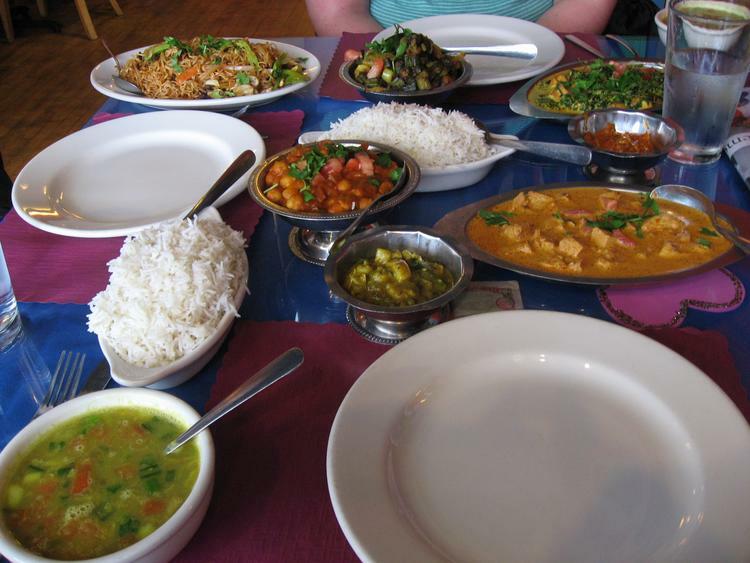 Anybody who wants to eat.” For most of his customers, Nepali food is a new experience. “One of the biggest rewards for me is teaching Minnesotans how to eat Nepali,” he says. Besides his great sense of accomplishment from watching something he created thrive and sharing Nepali culture, Padam has built the Empower Nepal Foundation, a nonprofit organization supporting education and infrastructure in Nepal. With the continued success of Everest on Grand, Padam Sharma feeds hungry people in Saint Paul and teaches them not just how to eat Nepalese but about Nepal itself. Browse listings for Indian and South Asian restaurants in our Saint Paul Almanac City Guide.